Diana Wong and Louis Csaba’s home theatre gives you the full cinematic experience – and every guest is a VIP. While most people head to an air-conditioned movie theatre in the summer to cool down and check out the last summer superhero blockbuster, Diana Wong and Louis Csaba don’t need to leave their house to enjoy a favourite movie. Every inch of their basement is put to good use -there’s an exercise area, hot tub and steam shower as you make your way to the most unique room in the house, the home theatre. Wong and Csaba are big movie buffs and host movie parties every Friday night. Family and friends often join in. The couple, of course, enjoys picking the film, but they do take special requests. The theatre room was built underneath the garage, a space not commonly utilized in most home builds. Csasba says that the room is pretty much soundproof because of where it is situated in the home. “You don’t realize how much wasted space there is under the garage, it’s a wonderful extra feature for our home,” Csaba says. As you enter the theatre, movie posters adorn the walls. Csaba’s favourite is Avatar, for Wong it’s Pearl Harbor. 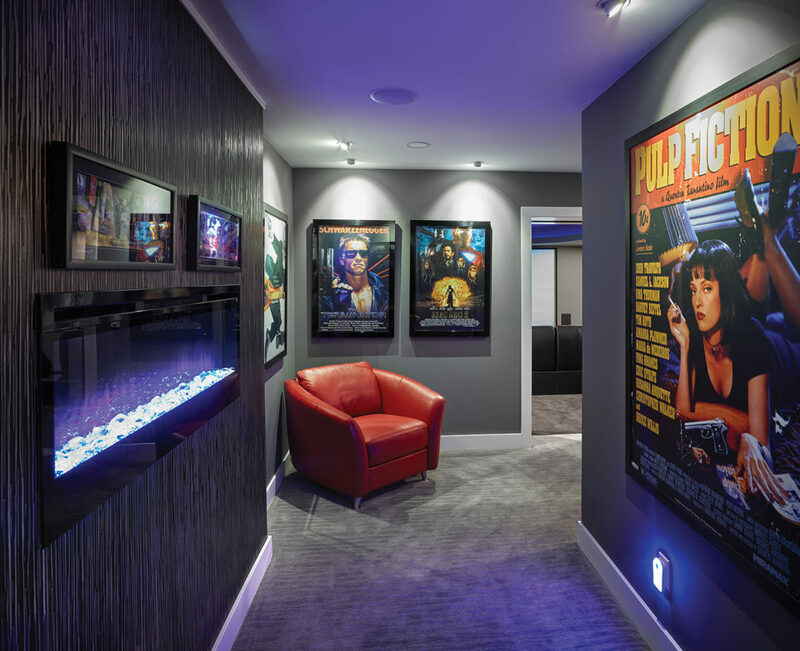 There are other classics like Braveheart, Pulp Fiction and Grease – the couple really wanted to model the entire space after a movie theatre. Watching movies is one of their favourite hobbies, so they thought, why not go all out? And you sure get the full theatre effect here. There are sky track doors that open automatically when you enter and leave the theatre area. 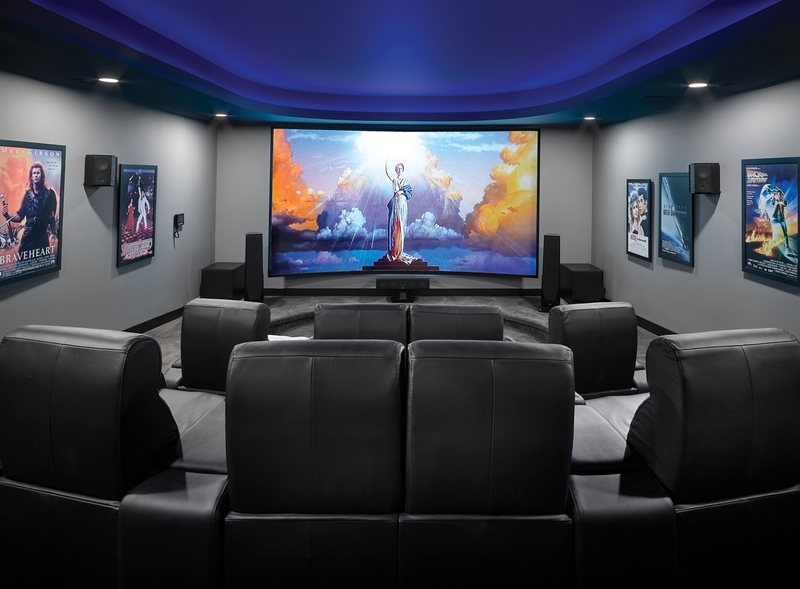 You can take your pick from eight reclining theatre seats complete with built-in speakers – there are 21 speakers total in the room – and D-Box motion technology to make the seats move along with the action in the film. The Dolby Atmos sound system technology makes you feel like you’re right in the action with its 3D-surround audio format. And, of course, the movie seats come with pop out trays to hold your drink and popcorn – which you can grab from the concession stand. The seating is staggered so you’ll have a clear view and never have to worry about trying to see over someone’s head. The lighting system consists of LED blue seating lights that dim once the movie starts to create the perfect ambiance. There’s even a VIP lounge area with a fireplace. It’s basically a full movie-going experience in the comfort of their own home. There’s even space in-between the screen and seating area for a dance party if the mood strikes. Downstairs is where you’ll also find the “man cave.” Csaba is a huge car enthusiast and has a collection of over 400 collector model cars encased in glass. There’s no shortage of stuff to do – whether it’s admiring the cars from the fire-engine red leather sofa or the bar or playing pinball, pool or slot machines while listening to your favourite songs on the jukebox. But the wow factor of the space is the full-size sports car. “There’s an elevator that can bring a car down and place it on a turntable. It’s great for entertaining and I can change up the car as many times as I would like,” Csaba says.